Today was our last day in Papeete proper. We spent it doing two very crucial tasks. One – Dave from Full Circle came over to help us tune the rig. This is yet another example of how kind and helpful the cruising community is. 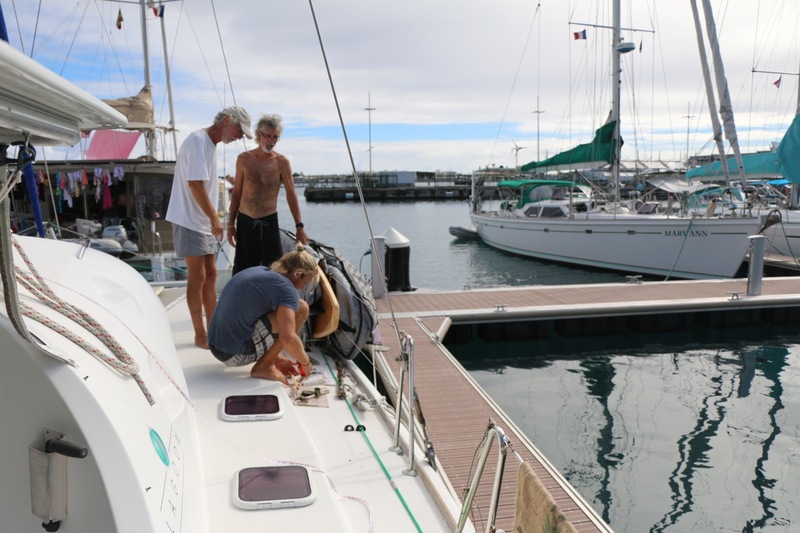 Dave, a wealth of information, offered to guide us through the proper procedure for tensioning Oceanna’s side shrouds. First he supplied us with the specifications on measuring rig loading, then he brought over his measuring callipers to assist in completing this very important task. In technical terms, the objective, when tuning the rig, is to tighten the 19 wire, steel cables to 5% of their breaking load. In nontechnical speak, you just want them to hold up the mast. The overall procedure began with Gregory using the turnbuckles to hand-tighten the shrouds. With that complete the rigging crew (Mark, Dave, and Gregory) taped a meter stick to the shroud, leaving a 10mm gap between the measuring stick end and the cable swedge for a reference point. Then the boys alternated between tightening the shroud and measuring the growing gap to achieve the desired outcome of 1mm of stretch per 2 meters of cable. I will admit that the inspection and maintenance of Oceanna’s standing rigging used to fall heavily under the “Leave it to the Professionals” column. A person only needs to hear so many rig failure stories to start believing that the powers that keep a mast in the air are one part material science, with another large part magic and inescapable destiny. Hence the mental filing of this task to the professionals. Though overtime we’ve learnt it’s just better to do things yourself. With the right knowledge, preparation, and tools everything is possible. (And with Gregory, Gregory is a very key piece.) Besides, two of the rig failures we heard about during this season’s Pacific Crossing had just had their standing rigging replaced by professionals. Just saying. Two – Though this task is not critical to the overall safety of our adventure the way that tuning the rig was, it certainly holds its importance in the team morale portion of the program. 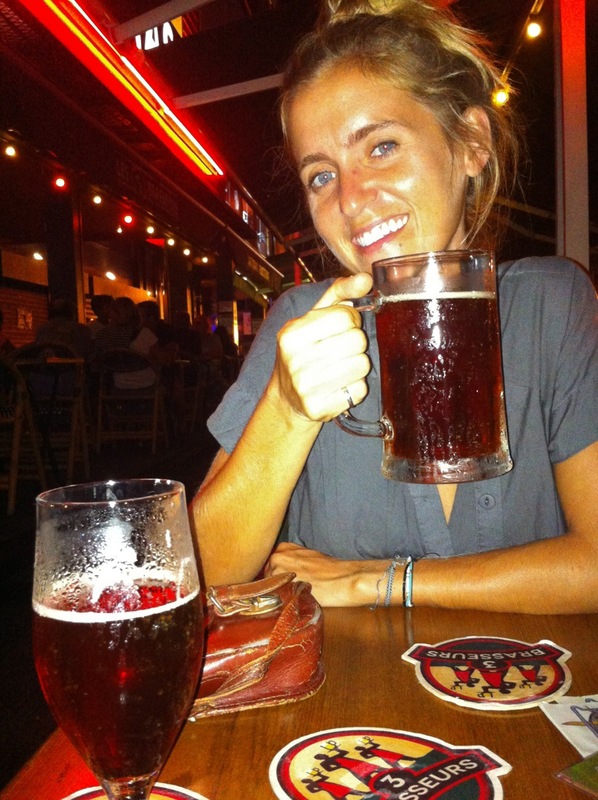 Call it what you will – beer, cerveza, or simply Balboa – beers throughout our adventure have been of a singular variety. Whether it was the Imperials of Colombia, the Balboas of Panama, or even the slightly better Hinanos of French Polyneisa they’re all light and devoid of taste. So when I heard there was a pub just down the road selling their very own micro-brew it went to the top of my to-visit list. Now I’m no beer connoisseur, but I know that if it tastes like a Coors Light it ain’t that good. 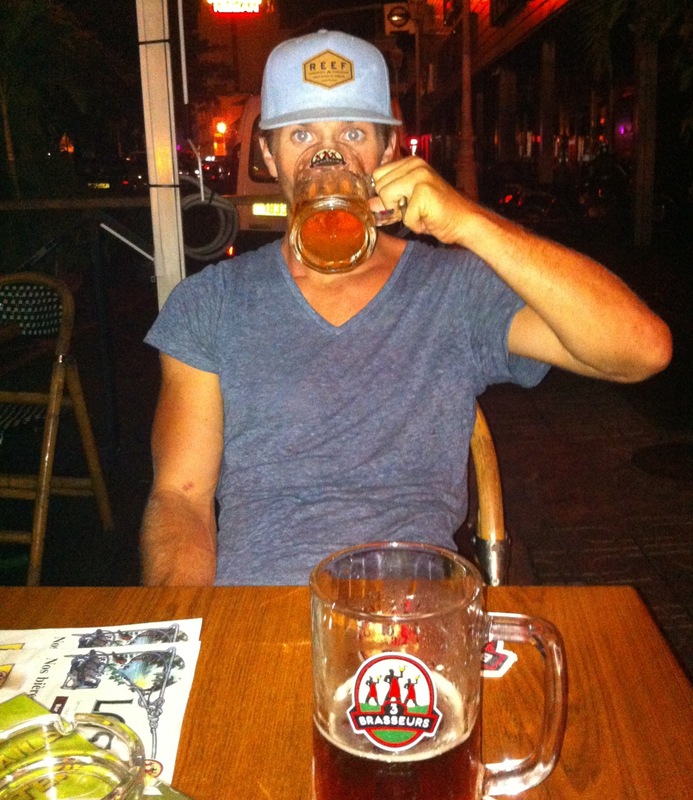 So when I lifted my first pint of 3 Brasseurs’ Amber Ale to my lips I was in heaven. And the second went down just as easy. 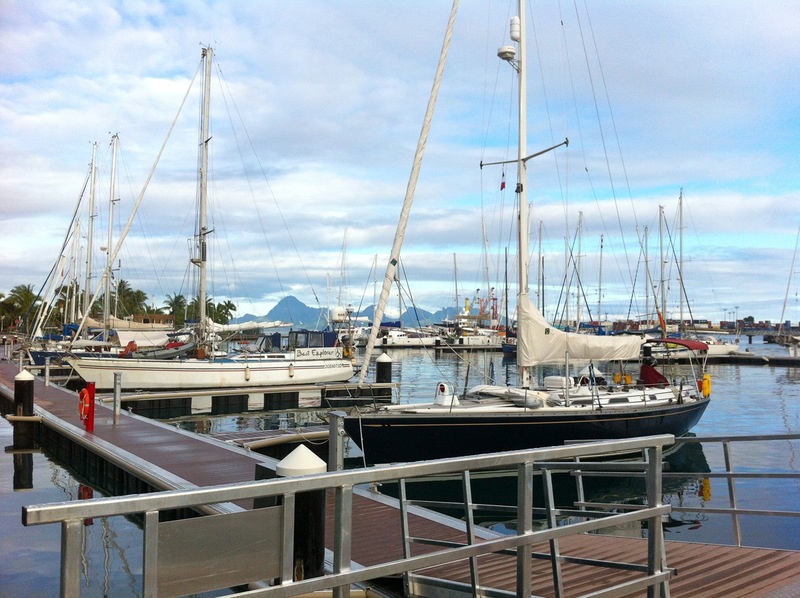 A view through the marina with Moorea rising up in the background. Pretty picturesque if you ask me. The tuning crew at work. Putting in the last couple turns.